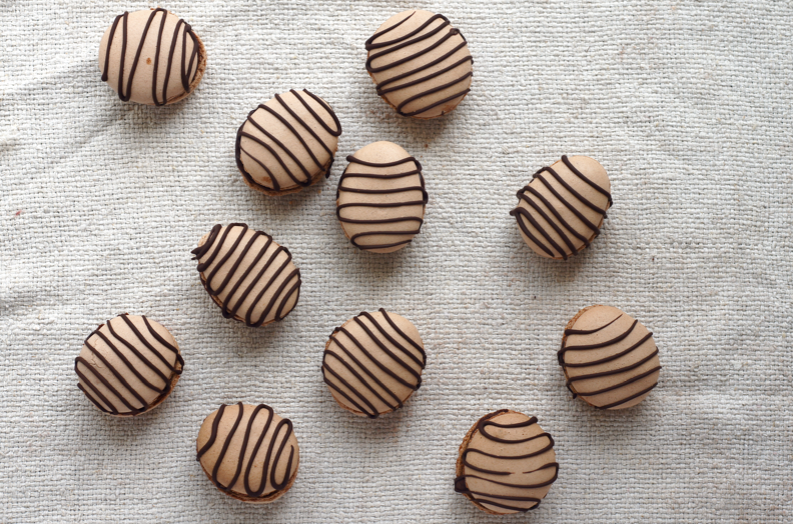 This month's Mactweets theme is Decadently Chocolate. Our macs had to have chocolate and "something, anything which will accentuate, complement the chocolate flavor and make for one spectacular mac!" As I was walking around the little local supermarket trying to think of my super-exciting flavour, I came upon the chocolate/sweets aisle. This seemed like a suitable hunting ground for Easter. 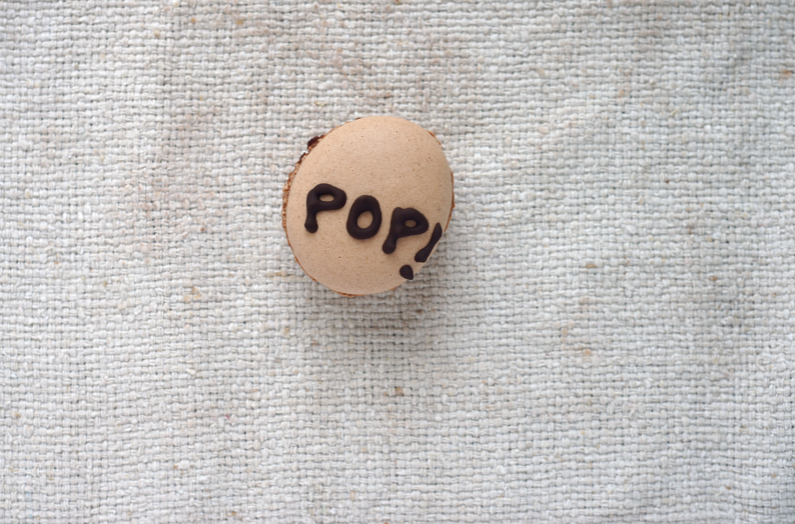 Then I spotted my POP - popping candy! 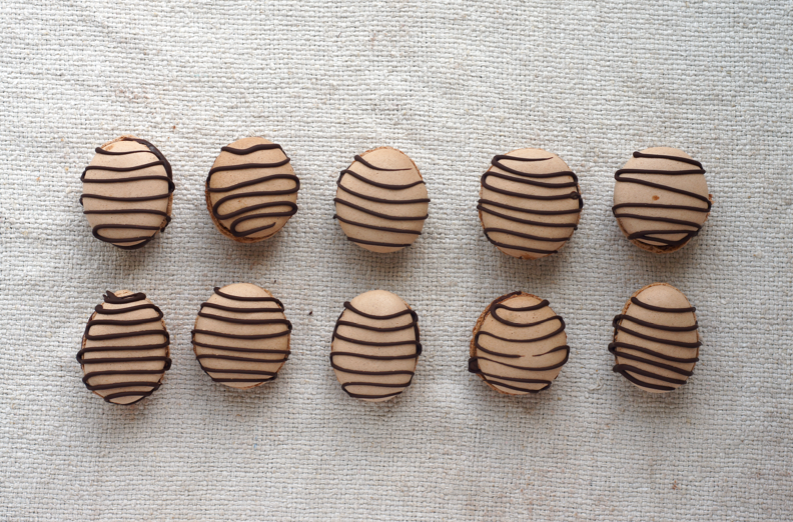 So these macs are egg shaped chocolate Italian macarons filled with a dark chocolate ganache and strawberry popping candy and finally piped dark chocolate on top. Because I matured them most of the pop was unfortunately gone. You had to stop chewing and concentrate to detect the sensation. Still, they tasted lovely. I tried a few other ways of using the candy too: I sprinkled some popping candy on the shells before baking but it melted and lost its fizzle. I also tried sticking some to the dark chocolate on top which worked fizzle-wise but looked a bit weird. I wondered about trying to somehow insert some into the shell after baking - or perhaps just pipe a circle of ganache and sit the candy in the middle. Another time. Happy Easter! Hope you all have a lovely weekend. Once again I adapted this Italian method recipe, scaled to 80g egg whites. I subbed 1 tbsp cocoa powder for 1 tbsp icing sugar. 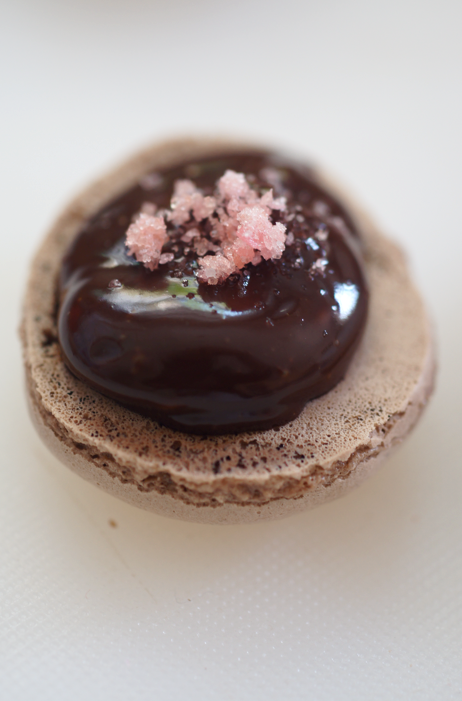 I then filled them with a simple 100ml/100g dark chocolate ganache and some of the popping candy. The feet are a bit small and I had a few problems with overcooking on one side of a sheet but otherwise pretty good. Oh my gosh!! These are the cutest ever!!!! I must borrow this idea sometime, is it okay? I'd really love to try this.. Well done you!!! I had big plans to make Easter Egg Macs too, but unfortunately never found time. So fun to see yours. The Egg Macs look just wonderful. elle marie - Aw, thanks. Of course - just send me a link so I can see :) Happy Easter! Barbara - Shame you didn't find time but I'm sure you'll find some another year. Happy Easter. Kirsten - Thank you and Happy Easter! I am in awe of your egg shapes. 4 batches and a lot of bad curse words later and I still couldn't pull it off. I LOVE the pop rocks. So fun and such beautiful macs. The chocolate drizzle is so pretty. Happy Easter! How cute! I am too scared to try macarons, but these are gorgeous! Your macarons are perfect!! I'm still too scared to even try. Very cute! Adorable! I continue to be impressed with your creativity in baking. Such an inspiration! I would have loved to have one of these. Pop candy was one of my fave candies when I was young...and I can imagine the delicate sensation in the heart of these beautiful macarons. 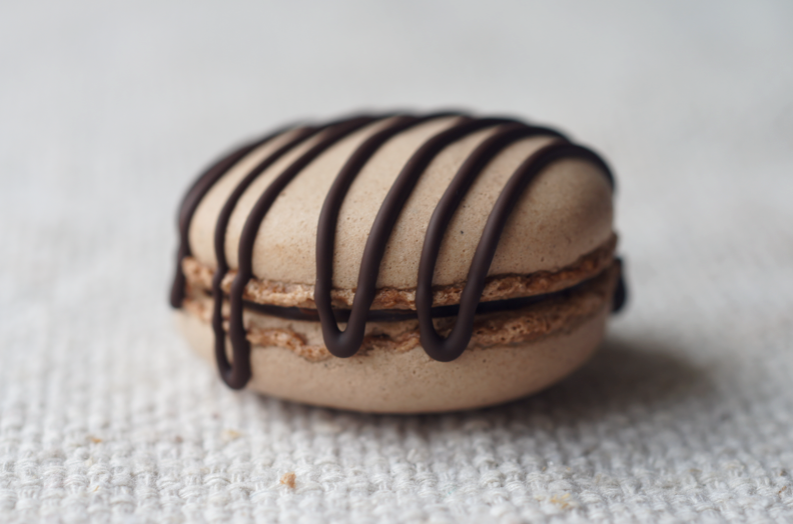 Love how smooth your macarons are. Lovely to have you over at MacTweets. Brilliant minds think alike--we both drizzled chocolate on our macs. But I like your unique egg shape and "pop" picture. I have a hard time working with chocolate because of our super warm weather in South Texas (not to mention my horrible hot flashes--ha ha). Saw some of your other food photos--wow, beautiful and creative cakes and inspiring decorations. How do you pipped them into an egg shape? Would you share? I drew out the egg shapes on a piece of paper, then slid the paper underneath my baking parchment as a guide. I then removed it before baking. Hope that helps.